I did this little quickie this morning, because I had a little extra time on my hands. I have one of those atomic alarm clocks that is over 15 years old. It changed to daylight savings automatically…. at the time of year it used to change. So when I thought I was getting up at 5:00 am, it was actually only 4:00. Mercy! 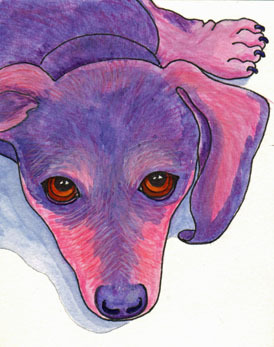 I don’t really even like this painting, but I know a few dachshund lovers that may look past the flaws. British prelate William Connor Magee was known as the Militant Bishop for his forceful speaking style, though he always worked for peace. He was born in 1821 in Ireland. Extremely bright, he enrolled in Trinity College at age 13. Ordained to a curacy at St. Thomas’s, Dublin, his fame as a speaker took him all the way to the powerful Archbishop of York. He spoke several times in the House of Lords, arguing against the dissolution of the Irish Church and against national temperance laws. He died on May 5, 1891. “Some of us are crazy about self-help books, inspirational tapes, and personal improvement seminars. We’ll buy or sign up for anything, whatever the price, if it promises revolutionary insights or a foolproof new system. We want relief in a day and deliverance in a weekend. And we want the expert of the hour to do it for us. There’s nothing wrong with wishing, of course. But there’s a lot wrong with kidding ourselves as a way of life.